Deputy prime minister Tan Sri Muhyiddin Yassin and Khazanah Nasional managing director Tan Sri Azman Mokhtar took time out from their busy schedules on Tuesday to launch Kidzania, a RM50 million “educational theme park from Mexico” that will create 400 jobs, reported the Business Times. Strip away the usual marketing hyperbole and Kidzania appears to be just a glorified play centre and property development project. “Theme park” for me conjures visions of acres and acres of space a’la Disneyland and Universal Studios. The Kidzania “theme park” will take up merely 60,000 square feet of space in a new mall. That’s equivalent to about 40 modest terrace (link) houses. Not 40 bungalows or mansions, just normal terrace houses. Also, the project entails the construction of a seven-storey new building. Khazanah is in an 80:20 joint-venture with Boustead Holdings to develop this project. 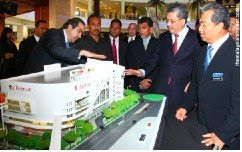 Boustead, developer of the Mutiara Damansara area and owner of the Curve mall in Selangor, will build a seven-storey structure to house KidZania (Picture from Malaysia Insider). KidZania needs only two floors of space, Petaling Jaya really does not need another mall. So why build a completely new property? Furthermore, I am sure the bulk of the 400 jobs will likely be low-skilled and low-paid. Those who have been to Disneyland, whether at your own or taxpayer expense, know most of the jobs are routine, menial and fulfilled by young people on a temporary basis. Hardly highly-skilled and certainly not creatively or intellectually challenging nor highly-paid. Still, a job is a job, But, in this case, does it warrant the attentions of not one, but two luminaries? None less than our deputy prime minister himself and the MD of Khazanah, who presides over TENS of billions of investments saw it fit to launch this project. In the meantime, tens of thousands of Malaysians are being thrown out of work, the government deficit is expected to hit a high 10% and sorely-needed capital is fleeing Malaysia, just to name a few items of great import. 1) Khazanah, in its own words, is “committed to building a globally competitive Malaysia by developing the right human capital”. What human capital does Kidzania really develop? 2) Why is Khazanah taking such a large 80% stake in this project? I doubt whether children’s play-centres can be considered among the “sectors that are deemed strategic to the nation's economy” that are supposed to be Khazanah’s focus. 3) What is Khazanah’s expected investment return on this project?